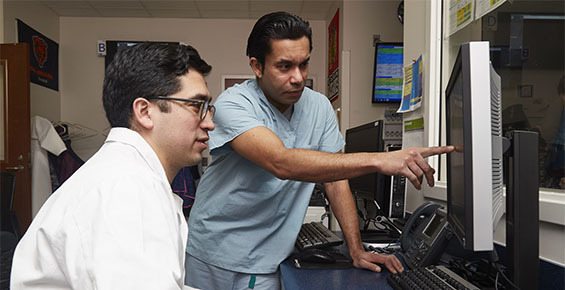 At the University of Chicago Medicine, we take an in-depth, personalized approach to evaluating patients for heart failure. Using the most advanced diagnostic equipment, we measure the performance of the heart and work to uncover the underlying cause of the patient’s heart failure. Cardiac MRI: A three-dimensional scan that gives detailed high-resolution images of the beating heart. Using this technology, our specialists study weakened heart muscle and visualize damage caused by a heart attack. Echocardiography (echo): A test that uses sound waves to examine heart muscle function, heart valve function and the flow of blood through the heart. We offer three-dimensional and surface analytics of the heart. Electrocardiography (EKG or ECG): An exam that uses electrodes placed on the skin to detect and measure the electrical function of the heart, showing abnormal rhythms. Exercise stress testing: A treadmill-based test that evaluates cardiac/pulmonary function and performance during exercise and recovery. This can determine the appropriate therapies to use for each patient. Cardiac catheterization: A procedure used to measure pressures inside the heart, to determine heart function and look for blockages in the coronary arteries. 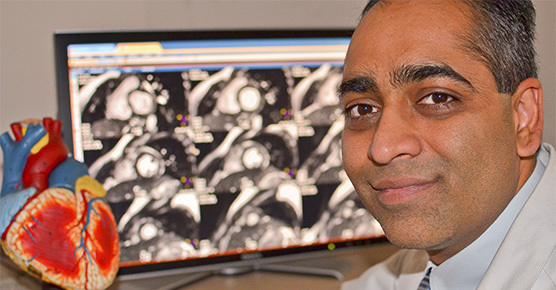 UChicago Medicine's Cardiovascular Imaging Center uses the most advanced noninvasive and minimally invasive approaches to see inside the heart. What are the treatment options for advanced heart failure?